Owner Mark Beatty with one of his two dogs, Koko. Public Transit: Nearest buses are the Western (49B) and the Lawrence (81); Nearest train is the Brown line Western stop. 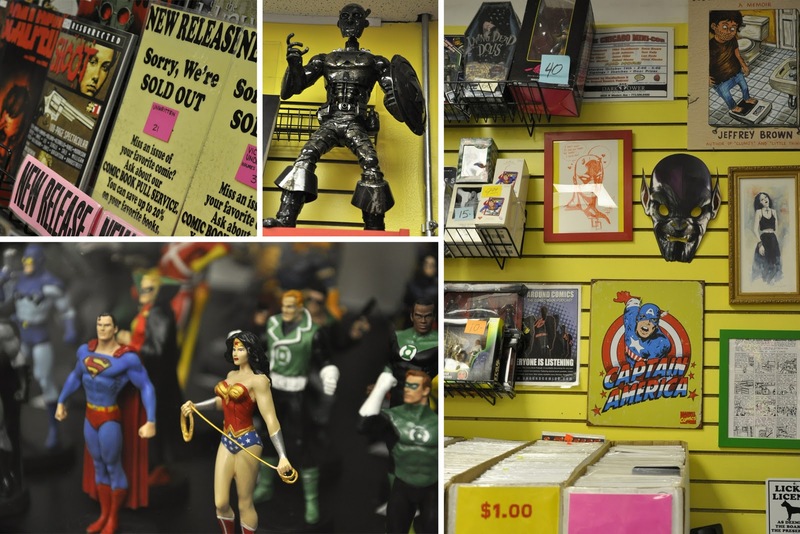 I miss living in close proximity to Dark Tower Comics & Collectibles, a homey store that quickly puts one at ease. With their flexible hours and extensive $1 back issue selection, this was one of my favorite stores for bargain hunting on lazy Sunday afternoons. (When you have a 9-5 job Tuesday through Saturday, you appreciate the businesses that stay open on Sunday and Monday. Many-a comic book stores and Thai restaurants have broken my heart over the years.) Since moving to another part of the city, I had not visited this store in well over a year and I was pleasantly surprised by some of their recent changes. They've done some rearranging that has given the store a more open feel. For one, they moved the counter to the back of the store. It used to be right by the entrance which was a little awkward for incoming and outgoing customers. The new layout has no aisles and instead opts for a donut shape, with delicious back issues in the middle. You'd be surprised how much of a difference a change in layout can make. It's always been a well organized store with plenty of merchandise, but now it is more inviting to browse with everything in easy view. 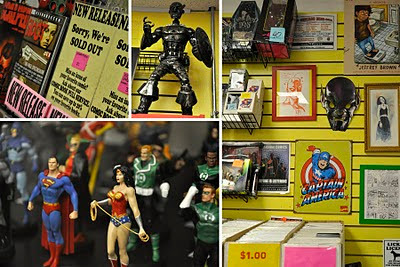 The toys, trade paperbacks, and comic book paraphernalia take up the majority of the right side of the store, back issues are in the middle, and new issues are arranged by publisher on the left wall. The individual comics are uninterrupted along the wall which makes for efficient browsing. You won't have to go searching for the indies or guess where they keep the Vertigo books since they are all in close proximity. I came in on a Tuesday when they were making spaces for the new books for the week. Plenty of stores use card holders with the issue number and title of the book, simply for their own sanity when making spaces and keeping track of what has sold out, but the large clear print of their signage has obviously been done with the customers in mind. These signs also show the discount available for subscribers. Most stores offer "club discounts", but it is not always clearly advertised. Yes, that is a custom Captain America statue made from motorcycle parts. All of these observations (open all week, wide range of merchandise to browse, well organized) demonstrate why this is a good comic book store, but they don't show how this is a unique comic book store, and Dark Tower is definitely special. That all comes down to the friendly staff and the atmosphere of the store. I came in with the hopes of visiting a few more shops nearby afterwards, but my afternoon was quickly consumed by long chats with owner Mark Beatty. Everything from comics to real estate were covered in conversation. A heated debate about the merits of Step Up 3-D were discussed with another employee. Books were recommended (Locke & Key - I really need to read this), websites were suggested, and stories about the Chicago comic book community were shared. Dark Tower even hosts the recordings of Around Comics, a popular podcast featuring fans and creators alike. You could go here for years and not know the dogs, Koko (bottom) and Daisy (top), were quietly sleeping behind the counter. You don't need to stay all afternoon in the store to get an idea of what Mark is like. 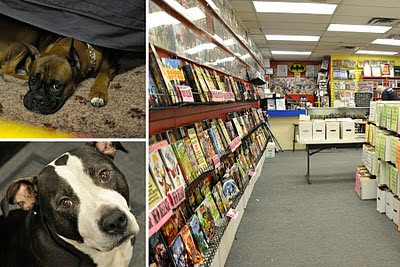 Just looking around the store will tell you a few key things; he is a big Captain America fan; he loves his dogs so much he brings them to work with him; and he has a wide taste in comics judging by the merchandise in the store. What you will get out of those long conversations, what you can't get from visual cues, is a genuine reciprocality of interest. 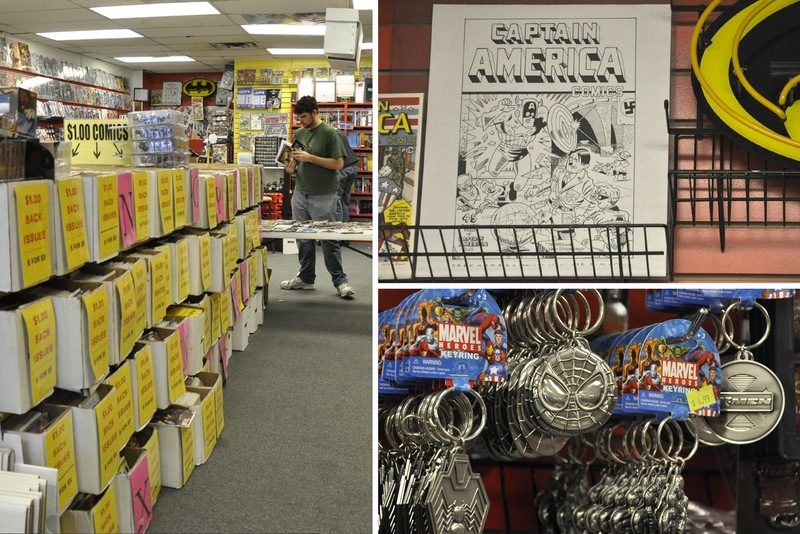 Mark wanted to know more about the project, as most store owners do once I mention it, but he also wanted to know what I was reading, what I thought about Ultimate Captain America #1, if I liked the new layout of the store. Most store owners are chatty people, but Mark is a conversationalist. He is willing to give you the time you offer in return, and that is rare. It's not like the guy doesn't work, you just don't get the feeling that you are taking up his precious little time. You can certainly pick up your books at Dark Tower and be on your way, too, but chances are you'll be compelled to stick around a little longer than you planned. The stereotype of "Comic Book Guy" is still fresh in popular culture's memory, and it's something that many fans and store owners alike would rather forget. There are still a few stodgy know-it-all proprietors out there (I think? ), but going in the opposite direction isn't much better either. I'm talking about employees that barely take notice of your existence. They ring up your books as if they were candy bars and soda at 7/11. They could care less about comics or they could have impressively extensive knowledge of your favorite titles and you wouldn't know either way because your conversations have never gone beyond "Cash or Credit?". Perhaps in our desire to distance ourselves from stereotypes, we as fans, customers, and store employees have become reluctant to "geek out", even in the most appropriate of settings. Shopping for comics in person is under-appreciated in the digital age, so it's refreshing to meet store owners like Mark that aren't afraid to get enthusiastic on various subjects. That may have seemed like an overly-long tangent, but my point is that Mark, and Dark Tower, offer the unique experience of making you feel as welcomed as your small-town store, but without the detachment that can come with big city burnout. Now that my affection for this store has been reignited, I'll be sure to resume my Sunday back issue hunting ritual. Therefore I recommend Dark Tower Comics, especially for those of you who may need a little extra TLC from your retailers. Mark has plenty to give! Don't just take my word for it; here's Jeffrey Brown's own glowing description of Dark Tower Comics, complete with adorable renderings of Mark (click for larger view). Some readers have been curious about whether I ever have anything negative to say about the stores I visit; I'm not sugarcoating my views of these stores, I just have not gone to any that I don't like yet. But I'm sure I will, and when I do, I won't hesitate to say why! Just enjoy the positivity while it lasts.